John is currently retired and working as a contract biologist. Boreal caribou were listed as Threatened in Canada in 2002. The most northern limit of the range of this species in Canada is in the area of the Mackenzie River Delta, Northwest Territories (NT). Current threats to boreal woodland caribou in this area include oil and gas exploration and development, roads developments, logging, increased tourism and other non-consumptive human activities, forest fires, and climate change. 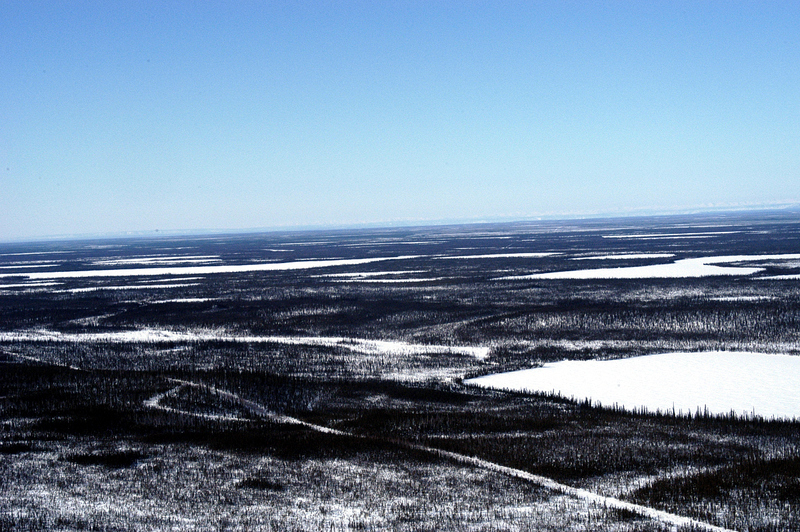 At present, much of the boreal caribou range in the Mackenzie River Valley has been altered by wildfires, past seismic activity, and road development, but the Mackenzie River Delta area is relatively pristine. However, this area is currently experiencing a significant increase in oil and gas exploration activities. A pipeline along the Mackenzie River Valley has been proposed to deliver natural gas to southern Canada. In response to potential large-scale changes to boreal caribou habitats and populations resulting from these activities, the Department of Environment and Natural Resources, GNWT in partnership with the Gwichâ€™in Renewable Resource Board began collecting baseline information on boreal caribou in the area of the Mackenzie Delta in 2001. 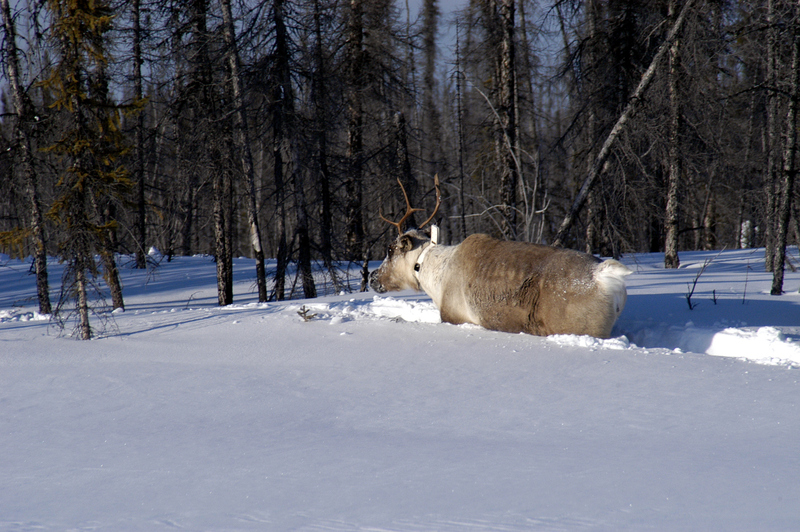 Traditional knowledge of boreal caribou was documented during the winter of 2001/2002. In the fall of 2001, a more detailed assessment was initiated to collect baseline information on the demography, distribution, movements, home range size, and habitat use for boreal caribou in the Lower Mackenzie River area . The study area is largely north of the Arctic Circle (66.55Â° latitude) and is primarily in the Gwichâ€™in Settlement Area in the Northwest Territories (NT), although the western portion extends into the Yukon Territory and the northern portion extends into the Inuvialuit Settlement Region, NT. Moose occur throughout the area but are at low densities. Predators include wolves, grizzly bears, black bears, and lynx, but numbers of wolves, grizzly bears, and black bears appear to be relatively low based on frequency of sightings. The terrain is relatively flat to rolling with the median elevation at approximately 90 m above sea level. Open black spruce, fens, and shrub meadows dominate upland and lowland areas. White spruce and mixed stands of spruce and paper birch occur on steeper slopes along rivers and streams. Wildfires have been common, with approximately 37 percent of area burned since 1960. The Dempster Highway follows nearly 160 km of the northwestern boundary of the study area between Inuvik, Tsiigehtchic and Fort McPherson. Oil and gas exploration has led to 11,052 km of seismic lines within the study area or an average of 0.25 km/km2. The majority of the activity took place during 1970-1979 and 1965-1969 when 20.4 and 10.5 percent of the seismic lines were cut, respectively. The majority of the seismic lines occur on the eastern and southern portions of the study area. I equipped boreal caribou with GPS, ARGOS, and VHF radio collars (Telonics, Mesa, Arizona) in spring 2002-06. I collected approximately 22,000 used locations for adult female caribou. I also located all collared caribou during the calving period (mid May to early June) 2002-06 to document calving rates; and, in late fall (late October to early November) 2003-06 and in late winter (late March to early April) 2003-06 to document over-summer and over winter calf and adult cow survival rates. Much of the boreal caribou demographic data published to date were derived during studies conducted in southern Canada where habitats have been altered to varying degrees by natural events and human activities. The lower Mackenzie River Valley is relatively pristine when compared to areas in southern Canada. Moose and other prey species occur at relatively low densities as are predators (wolves, grizzly bears, and black bears). I described the demographic characteristics of these boreal caribou including population densities, typical seasonal groups sizes, pregnancy rates, calving rates, and over-summer and over-winter adult and calf survival rates. When possible these data were compared with that reported for other regions of Canada. Space use strategies and movement rates have been described for a number of species including boreal caribou in southern Canada where habitats have been altered to varying degrees by natural events and human activities. 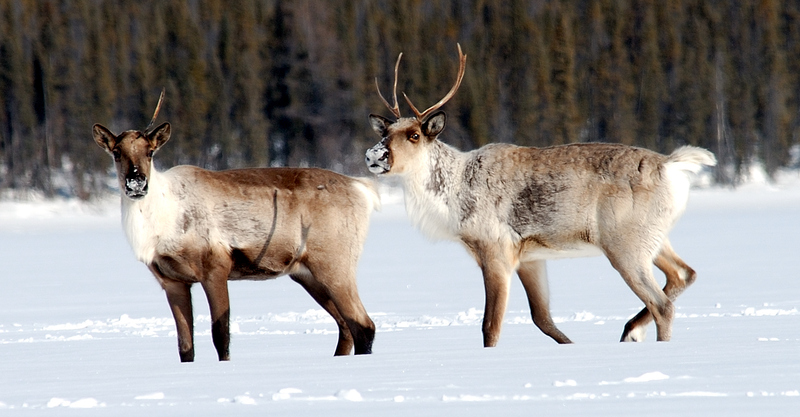 Unlike these southern populations, boreal caribou in the lower Mackenzie River Valley occupy relatively pristine habitats where predators and prey species occur at low densities. Primary productivity is influenced by a severe Arctic environment and the vegetation cover has been strongly influence by wildfires. These factors in combination have created a unique environment. I described the space use strategies of boreal caribou in the Mackenzie Delta area including the size and distribution of seasonal and annual ranges, fidelity to seasonal and annual ranges, changes in movement rates during the year, movements rates around the calving period, and distribution and fidelity to calving site. I compared space use strategies of these caribou with that of other boreal caribou populations in the NT and northern Alberta and mountain woodland, barren-ground, Peary, and Dolphin & Union caribou. Resource selection function models (RSF) are now commonly used to evaluate spatial patterns of habitat use and occurrence of wildlife. RSF models are used to identify areas of important habitat resources thus allowing managers to monitor and plan land use activities to protect habitat or minimize or mitigate habitat loss. I used boreal caribou GPS location data and digital earth cover data (Ducks Unlimited) to generate seasonal RSF models, and to map the seasonally important areas for boreal caribou in the area of the Mackenzie River Delta. Boreal caribou site selection is likely influenced by a number of factors including forage availability (habitat quality) and predation risk. Since fires decrease available lichens, they may be important determinants of forage availability and caribou range use and demography. Predation has generally been regarded as a severe limiting factor for boreal caribou and as a result they select sites to minimize predation risk. Areas with a high probability of occurrence of a species identified through RSF modeling should have high habitat values for that species. Annual and seasonal home range sizes and adult and calf survival for boreal caribou should reflect the distribution and size of patches of moderate to high quality habitats and where predation risk is minimized. I looked at the relationship between the large-scale characteristics of annual and seasonal ranges of boreal caribou cows and calf and adult survival. I also looked at whether boreal caribou avoided anthropogenic features (seismic lines and roads), and if this response varied seasonally.